Ruffwear's Swamp Cooler Vest in graphite grey is specially designed to help your dog cool off on hot summer days! 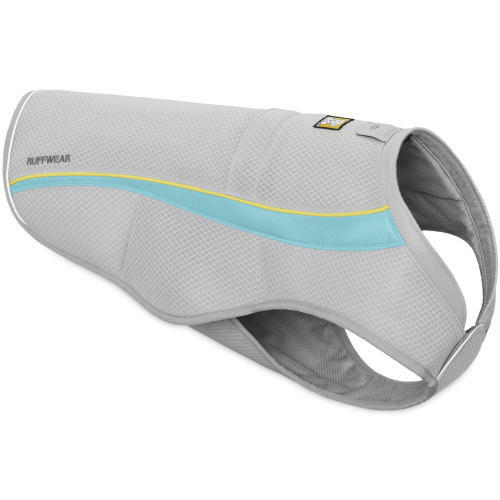 Making use of natural evaporative cooling, simply soak the vest in cold water, wring it out, and put it on your pooch! Your dog's body heat will be absorbed by the water before evaporation takes it away, whilst the pale colour reflects the sun's harsh rays! Providing maximum cooling with minimum fuss, the Swamp Cooler vest features an active fit to allow your dog unrestricted motion, whilst the side-release buckles allow for fast release for speedy on-off. The Swamp cooler also features a reflective trim to help keep your dog safe in low light. When measuring your dog for their new dog coat, it is important that you measure from the length from base of the neck to the start of the tail. This is where the head joins the body and where the tail joins the body. Make sure your dog is standing squarely upright on all four legs and is looking straight ahead for an accurate measurement. Secondly, measure the circumference around the widest part of the ribcage Once you have done this you then need to refer to the size chart. If your dog's size does not match the size we have, then you should round up for dogs with downward tails and round down for dogs with upward tails.